Buy 5 boxes of Federal Rimfire ammo and get a rebate for the value of the cheapest box! This is essentially 20% off any Federal Rimfire ammunition when you use this rebate through 3/31/19. Max savings of $200! Although they are among the less expensive calibers of ammunition available on the market today, a great 22 LR round offers many advantages over ones made according to less exacting standards. 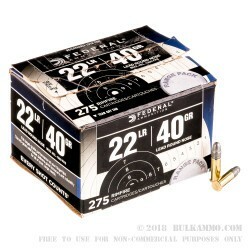 Federal Ammunition’s 22 LR 40 grain lead round nose exemplifies the former variety. 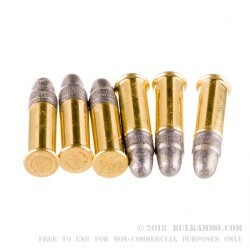 With its non-corrosive Boxer-primed rimfire brass casing, this round promotes reliable feeding while at the same time minimizing the risk of jamming and misfiring. It further reduces the accumulation of excessive powder and lead residues in your firearm. 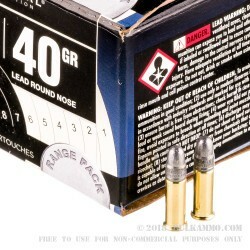 Optimized for semi-automatic firearms including AR-15 style weapons, this ammunition’s lead round nose offers superior varmint hunting performance owing to its relatively great impact energy, high 1,200 fps muzzle velocity, and ability to penetrate targets. Because it is also inexpensive, it is suitable for use during a long afternoon of plinking or training as well. Minnesota-based Federal Ammunition has been in business now for nearly one century, and owes their success to the high value they place on innovation and technology in their manufacturing process.